The Castle View Apartments Cesky Krumlov is situated just off the main town square. Guests will find that the hotel offers a view of the top of Krumlov Castle. The Museum of Puppets and the Wax Museum can also be found within easy reach. The Castle View Apartments Cesky Krumlov is located a few hours away from the Prague airport, which is accessible by shuttle, bus, or train in only a few hours. The city itself is designed to be easily explored on foot. Each of the guestrooms at the Castle View Apartments Cesky Krumlov includes high speed Internet access. All rooms offer heated bathroom floors, kitchenettes, and comfortable bedding. Rooms also include televisions, microwaves, tubs, showers, and hair dryers, and one room offers a balcony with a panoramic view. 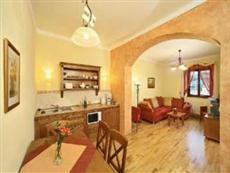 Guests of the Castle View Apartments Cesky Krumlov will find a number of shops and restaurants in the surrounding area. The hotel offers a business center onsite for guests. There are also a number of other onsite comforts on offer.